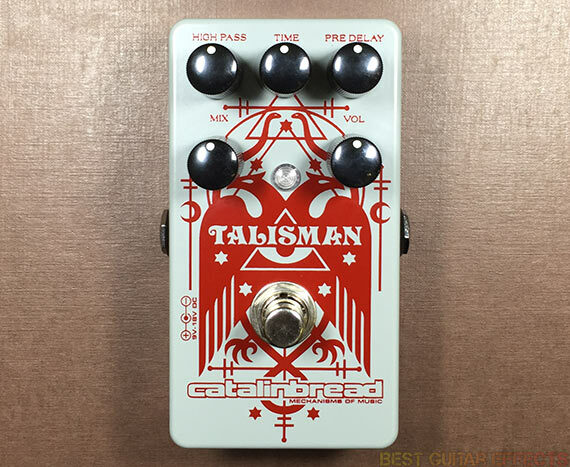 Catalinbread Talisman Review – Best Plate Reverb Pedal? The Catalinbread Talisman is a compact reverb pedal that seeks to emulate the sounds of the legendary EMT 140, a hulking 7ft long x 4ft tall studio plate reverb. While plate reverb has long been a mainstay effect in the studio, guitarists have had relatively few sources for attaining authentic plate reverb sounds as most digitally modeled “plate” algorithms seem to fall short of capturing the mesmerizing detail of an actual resonating reverb plate. Thankfully, rather than trying to emulate the concept of plate reverb, Catalinbread spent some time with an actual EMT 140 in their pursuit of charging the Talisman with the magical essence of its iconic predecessor. Is this the best digital plate reverb pedal around? Our Catalinbread Talisman review will reveal whether or not this amulet deserves a place on your pedalboard. Vol knob controls level of a discrete preamp and offers a lot of boost on tap. Pre Delay knob adds space before the reverb and delays it by up to about 100mS. Time knob controls length of the reverb and offers infinite sustain possibilities. High Pass knob rolls of the low frequencies of the reverb to increase clarity. Mix knob alters the wet to dry ratio of the unaffected and reverberated signals. Buffered mode (default) for reverb trails when bypassed. True Bypass mode for no trails and letting signal pass unaffected when disengaged. Powered by 9-18VDC power adapter. Visit Catalinbread for more info about the Talisman. I had a chance to hear the Catalinbread Talisman at Winter NAMM 2015 and was immediately impressed by the sounds of this pedal. The Talisman deserves to be recognized for its greatness as it’s simply one of the most impressive compact reverb pedals I’ve played. It’s arguably the best plate reverb you’ll find in a compact stompbox. Catalinbread nailed the essence of what makes a plate reverb inspiring to behold and have added a few nice touches to make this pedal standout among the swarm of multi-algorithm reverb processors available that feature plate reverb modes. Starting with all the knobs rolled down and activating the pedal in its default buffered mode, you’ll be treated to your same pristine dry tone without any audible “pop” as you engage the pedal. Bringing up the Mix to around noon (50%) introduces a healthy ambience heard behind your playing. It’s a short slap-back style wash with a quick decay. The initial reverb tone is already very pleasing to the ears and easily as good as any other quality reverb pedal you’ve played. Increasing the Time value extends the decay from that short ambient smear to an all-encompassing void of eternity. Is that too abstract? Basically, with only simple adjustments of Mix and Time, the Talisman offers huge reverb that not only rivals other digital plate reverbs but larger hall and cathedral style reverbs as well. Try cranking the Time to around 3 o’clock, kicking on a Dirty Little Secret in front, and hitting some big rock chords and fading them into the reverb with your guitar’s volume knob. The Talisman sounds huge! Now come ye neophytes; these sounds are but your introduction to the order of the Talisman. There are still 3 features – or 3 degrees of initiation to attaining true mastery of the Talisman’s many secrets. The first uniquely “Talismanic” feature is the Pre Delay knob. Sure, many reverb pedals have some variation of a pre-delay or reflections control that affects the initial timing of the reverb’s placement, but the Talisman gets it right. The old EMT 140 plates were miked, EQ’d, and fed into the reverb returns of mixing consoles. Delay was introduced to create the perfect timing for when the reverb would initially hit. The Talisman provides a sufficient amount of delay to give you a quick eighth note or quarter note delay, depending on your song’s tempo. Of course, you can also simply keep it short for a generally always-on reverb without concern for timing. The second interesting inclusion is the High Pass knob. The Talisman’s High Pass control is perhaps its most useful parameter, far surpassing the generic “tone” controls of most reverb pedals. It essentially removes the low-end content from the reverb for a sound that always maintains maximum clarity while preserving the top-end sheen of the plate’s reflections. Remember how I mentioned that EMT 140 units were miked and EQ’d? Well, the Talisman nails the utility of this technique, and its High Pass is absolutely indispensable for getting the most out of this pedal. Too much bass from a wet reverb signal will muddy up your low-end and ruin your mix in a live setting or in the studio. The Talisman delivers on its promise to give you studio style control thanks to this simple knob. Crank it up around half-way and tweak; you’ll hear its impact on your sound. You can even get away with longer Time settings for a reverb that floats above your playing. The third and final grade of the Talisman’s illumination is its Vol knob. This controls the level of a discrete preamp. If you keep it turned down, it pretty much lets your signal pass at unity gain. But if you start cranking it up your overall signal gets hotter and louder. I find a little boost to be helpful with very high Mix knob settings where having less dry signal results in some slight volume loss. Pushing up the Vol knob a bit restores it. Also, if you have the Talisman in your amp’s effects loop, you can add a little more girth and presence to your sound before it hits your power amp. Be mindful and follow your ears as always. And of course, you can just throw the book out the window and crank the Vol, sending the whole mess into the front of your amp with reckless abandon. The increased output will also induce some overdrive from your amp for wild and nasty lead tones. It’s again worth emphasizing that the default buffered mode sounds great. With all the hoo-rah about “buffered bypass vs true bypass”, Catalinbread gives you the best of both worlds. I especially prefer the default buffered setting as this lets your reverb decay naturally when you bypass the pedal. You can even crank the Time and play over sustaining reverb when bypassed, activate the pedal to “record” new reverb, and bypass it again to continue playing over it. Very fun. If you want the abrupt silence of true bypass, simply open the bottom plate and flip the switch. Otherwise the buffer is solid and also shouldn’t be a compromise of your tone. 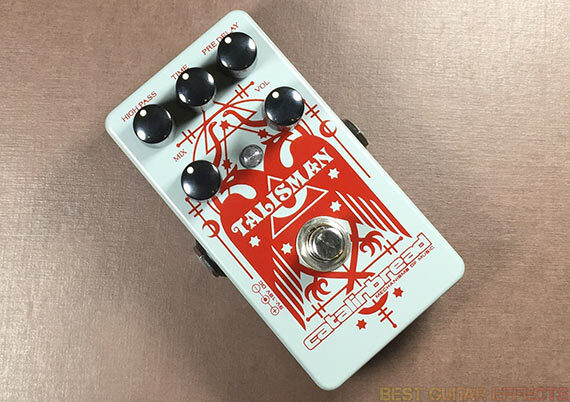 These days you can find plenty of great multi-algorithm reverb guitar pedals, but the Talisman is still worth considering despite that it essentially offers one kind of reverb. That’s a testament to just how good it is at what it does. Just like how Catalinbread tackled the classic Binson Echorec with their wildly successful namesake Echorec tape delay pedal and the Marshall Super Lead & Super Bass guitar amplifiers with the Dirty Little Secret, the Talisman sought to capture an EMT 140 in a stompbox and came out with a stellar plate reverb. If I had to complain about something, I’d ask for slightly longer Pre Delay times as I find myself really enjoying using it as a heavily delayed rhythmic reverb effect. But it’s really hard to find fault with this one. Whether it becomes a companion reverb in your collection or the defining reverb on your pedalboard, the Catalinbread Talisman is an exceptionally well-executed pedal. 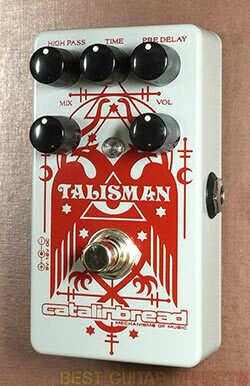 The Catalinbread Talisman is an excellent plate reverb and one of my personal favorite standard sized reverb pedal. It’s truly impressive how Catalinbread was able to achieve such an array of great reverb tones from a pedal with a seemingly singular focus: emulating an EMT 140 plate reverb. But thanks to its intuitive and easy-to-use controls (especially the High Pass), the Talisman can cover always-on ambience to huge infinite reverb and a range of sounds in between. The Talisman reigns supreme among stompbox verbs and is definitely worth checking out. That concludes our Catalinbread Talisman review. Thanks for reading. Want to buy the Catalinbread Talisman?